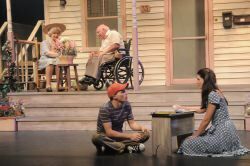 Henrico Theatre Company opened a quiet, heartfelt play this past weekend. 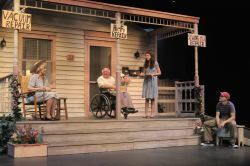 Tender Lies, a comedy-drama by Nancy Pahl Gilsenan, focuses on an old man’s efforts to help his tenants achieve personal growth. He nudges them along with “tender lies” carefully crafted to encourage them to move forward with their lives. Arlo Gibson (John Hagadorn) owns a quaint house in 1960s San José, and he has assembled a collection of broken misfits living under his roof. Sheila (Amy Mawyer) constantly worries about her physical appearance and fears she’s a terrible mother to Ben (Matt Hackman). Ellie (Rebekah Spence) is losing her memory. Mrs. Galarza (Beth McKenzie-Mohr) is a drunk who can’t hold a job, and her daughter Isabel (Louise Mason) spends her spare time sitting on the same bench sketching the same street in charcoal, all by her lonesome. The story is told through Ben’s memory, 21 years later. Hackman plays both the adult Ben and the character’s teenage self, and he does a great job distinguishing them. He gives the teenager suitably awkward body language and a still-developing voice, while he presents the adult as more poised, confident, and articulate. He makes a wonderful narrator as he guides us through the events, and you believe him as a teenager. Hagadorn brings gravitas to the role of the wheelchair-bound Arlo. He’s a natural as the wise, crafty old man whose heart is in the right place, and Hagadorn ensures that that heart shines through. Arlo remains likeable from start to finish, despite his penchant for dishonesty. Mason gives an appropriately subdued performance as Isabel, introducing her with an air of mystery and charm that makes the audience eager to learn more about the character. Mawyer is amusingly neurotic as Sheila. Spence nails some great lines as Ellie. McKenzie-Mohr is fun as a Spanish-speaking drunk. Brian Martin does a fine job as the self-centered banker Mr. Bellon, as does Don Polaski as the insensitive Mr. Fuller. The house itself is an important character, specifically its front porch where everyone gathers. Set designer Lin Heath gave it the necessary care and attention. It looks great and it’s a functional set, and director Richard Koch makes full use of it. Kudos also goes to the set construction crew — they clearly put a lot of hard work into it. Henrico Theatre Company made an excellent choice with Tender Lies. It starts off a little slow, but it comes together wonderfully. More importantly, it gets you thinking about the nature of white lies and whether they’re more of a help or a hindrance. Disclaimer: Henrico Theatre Company provided two complimentary media tickets to ShowBizRadio for this review. This article can be linked to as: http://showbizradio.com/go/9714.